One of the first things that we did for the film I’m working on this weekend was take “family photos” with the art director Adam Dietrich. He printed them and put them in frames around the set — a really nice house — where we’re filming so it looked like “our” family really lived there. Every photo meant a costume change for me and Taylor — good thing my grandma always over packs wardrobe for shoots, I guess. Super talented actors to to work with, and a great crew. In this picture, from left, are Taylor Ernzen, Cassie Shea Watson, me, and Ashla Soter. 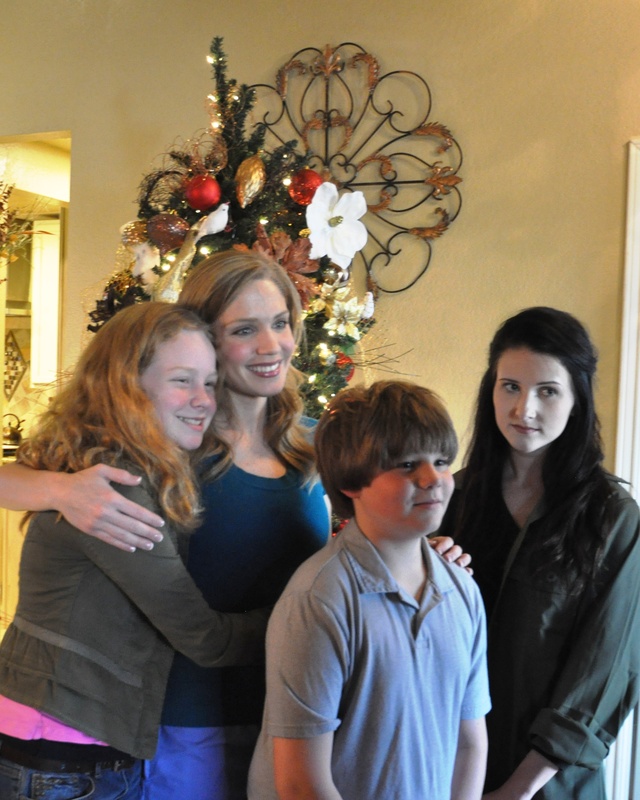 Cassie is the lead character, and plays my mom, and Taylor and Ashla play my sisters. It’s really funny that Ashla is playing this kind of Goth, grumpy teenager at the beginning of the film, because she’s nothing like that in person — she’s always smiling. More photos for the art director. His name is Adam Dietrich, and he’s really cool. He’s one of the lead actors in the film, too, playing a character named Sarge. The neighbors come out of their houses and look at us kind of funny because of the two big equipment trucks and all the gear. There are power chords running across two front yards — we’re staging in one house, and shooting in the one next door. Wonder what the neighbors will think when there are 60-80 zombies running around? 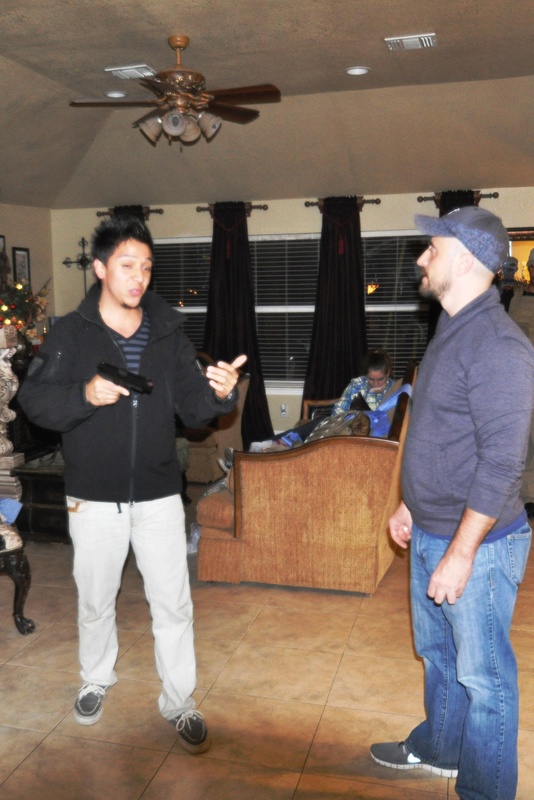 The prop master (Alan Martinez) is teaching Adam Dietrich (Sarge) how to handle the prop guns. Some of them look like AK-47s, and some of them are handguns. They shoot hot air, because there is a gas canister inside that makes them sound like real gunshots. But the “bullets” and “trace” is all added in post-production, so they’re save. It’s kind of weird to be sitting and waiting for a take when someone runs by and points a big gun at you, though! I had my iPod on during a break when Adam came rushing up to me pointing a gun at me and shouted, “Get down! Get down on the floor!” Then he threw himself down next to me and whispered, “And keep listening to good music!” This film shoot is a lot of fun so far. A long day yesterday — we didn’t break until 10:30, and some of the crew was there until midnight. 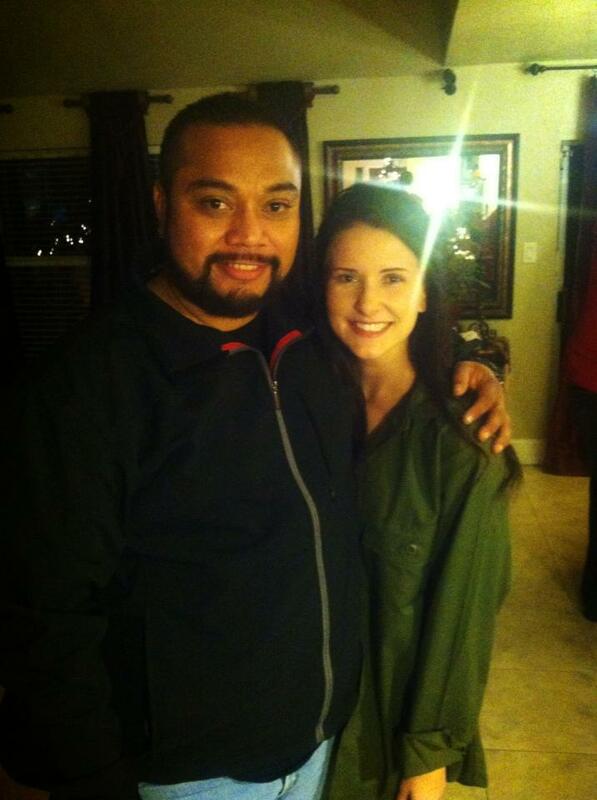 This is a picture of our director, Vincent Moctezuma and Ashla Soter, who plays my big sister in the movie. Ashla, Taylor and I all take acting classes from Nancy Chartier — she’s the best. Vincent is a really cool director, and he gives good direction, so you always know what he wants. We had to do a bunch of takes on one scene yesterday because they are shooting with just one camera and they wanted a bunch of different angles for some special effects later. So they took a lot of “OTS” shots — that means the camera is behind one actor, shooting over their shoulder at the others. And they moved the camera around while we did the scene over and over. It’s going to look really cool when the CGI is done. 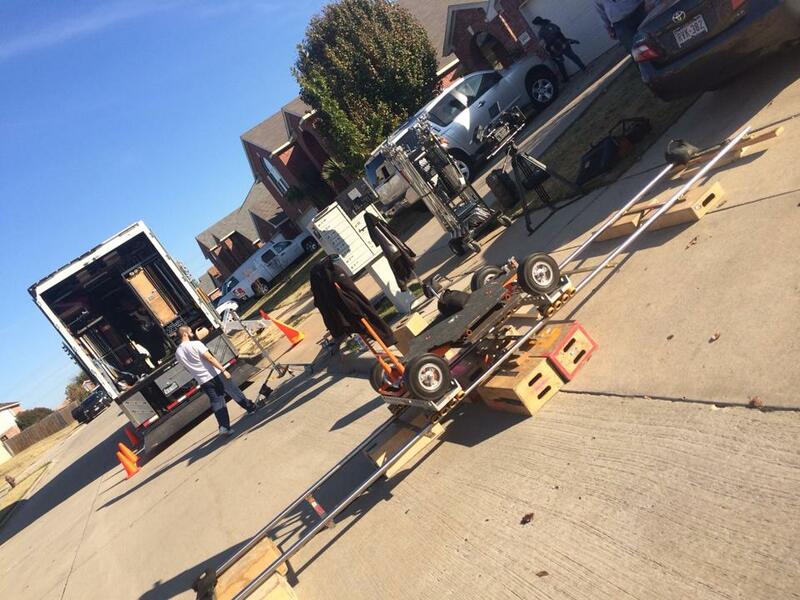 This is just part of what the gear set up outside the house where we are filming looks like. Two trucks, lots of “dollies” (those tracks and the wheeled cart for the camera), and tons of lighting, sound and other gear. The director, Vincent Moctezuma, took this photo and posted it on his Facebook page; I didn’t take it. I am heading back to the set now, so I will take more photos today. 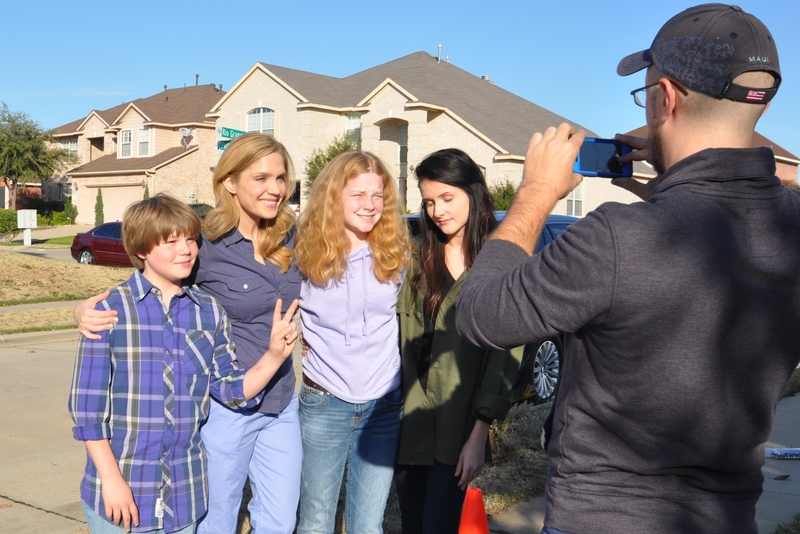 I noticed your blog named “Meet My New “Family”: On Set Photos from Ghede Origins | Kameron Rie Badgers”. Your writing style is bravo, keep up the good work! Congratulations on the movie — I will see you on the big screen soon!